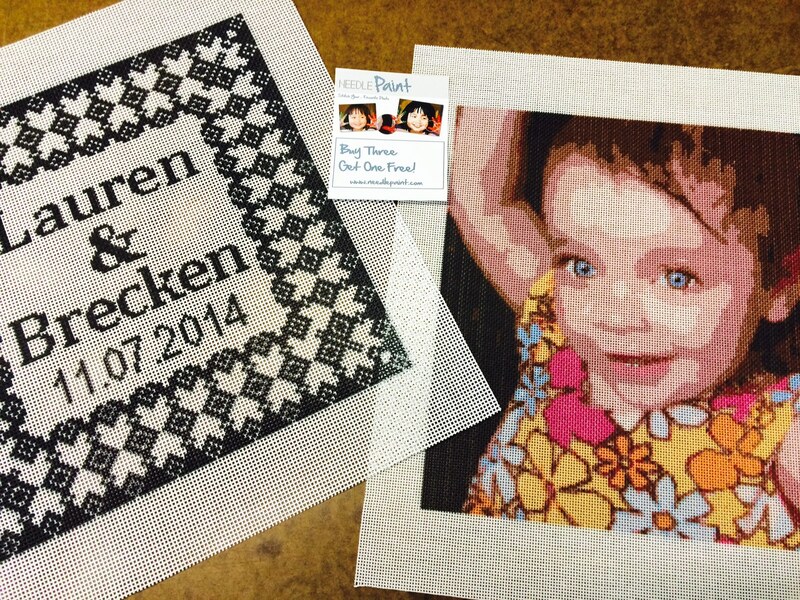 This week we’ve broken our record for the number of canvases ordered in a single week! 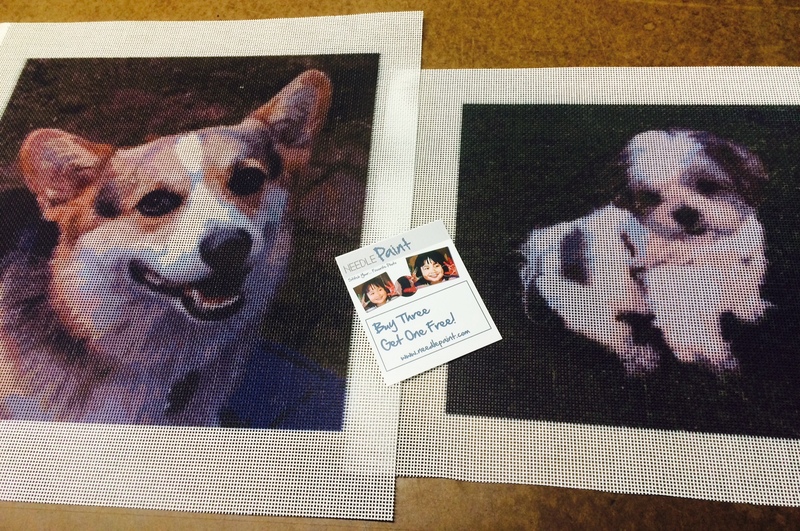 Below are some of our favorite custom needlepoint canvases we made yesterday, enjoy! Thinking that it might be nice to have snow falling behind the penguins of the Alexander and Issac stockings, I tried a blue and white mosaic strip as diagrammed below in blue and grey. I really liked the stitch. It covered the canvas well and was quick to do. And the added bonus was that the white was easy to take out. 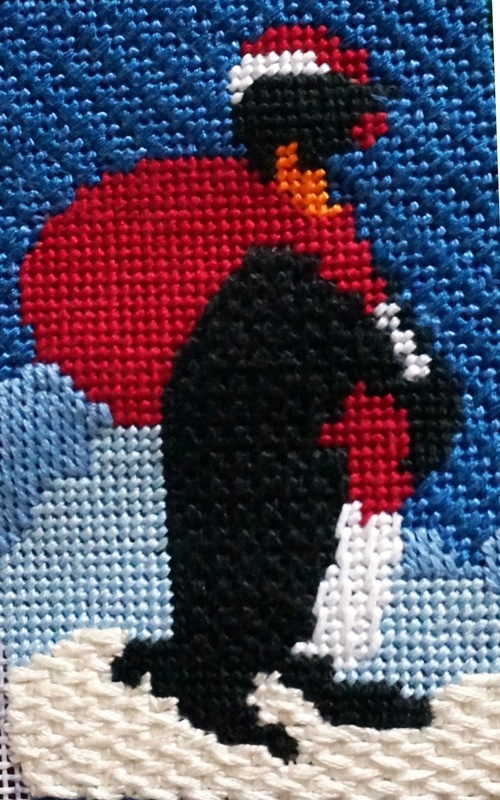 By changing the white in the photo, to a slightly lighter blue on the Isaac stocking’s large penguin, I got a background that gave some depths and movement. 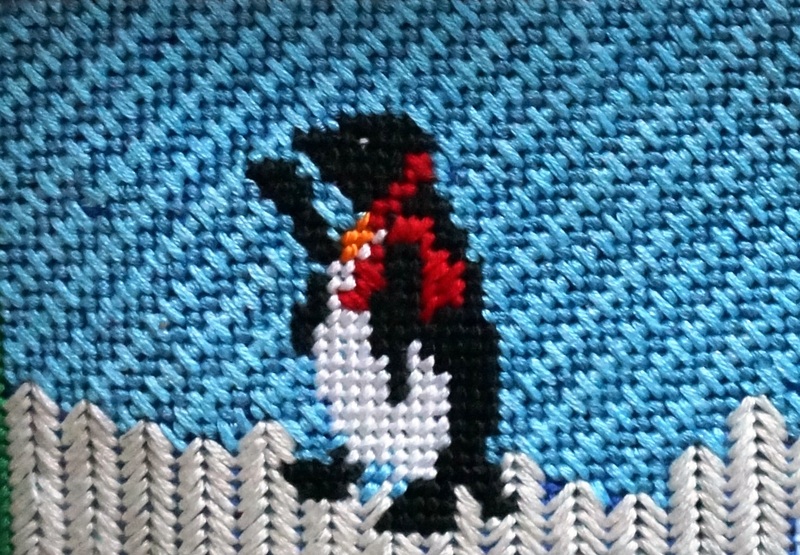 For the Alexander’s little penguin, I reversed the direction of the stitches (i.e., rotated the diagram 90 degrees) and used a darker blue for the grey stitches. My fingers were flying and ready of Isaac’s Santa. 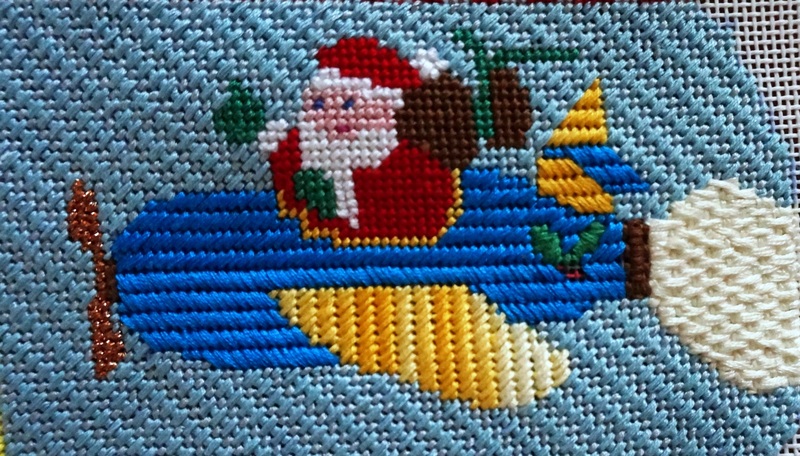 Santa got a variegated blue sky, the puffy snow for his airplane’s exhaust, and a shiny propeller (more about metallic threads in my next blog). 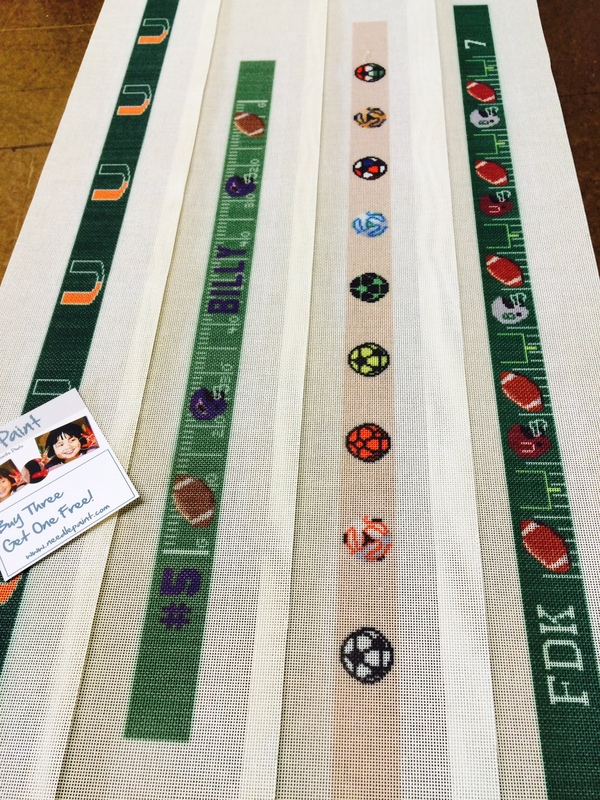 Friday Favorites – Football Needlepoint Belts – Photo Canvases and Reviews! Happy Weekend! It is snowing again in Colorado, which is great for the ski resorts or for getting some good quality time to spend on your Christmas projects. But, on to the new projects! 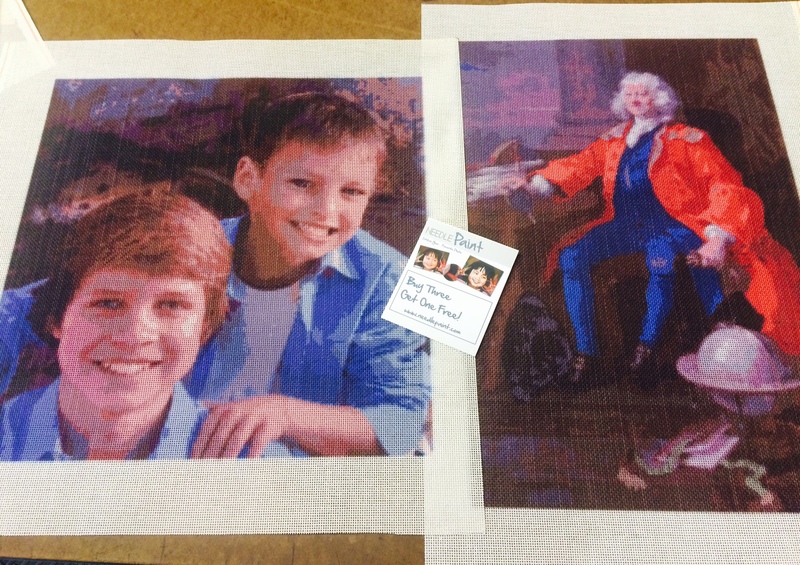 We did a lot of custom belt needlepoint canvases this week. Three for football lovers. The other canvas I slipped into the picture is also called football in the rest of the world. 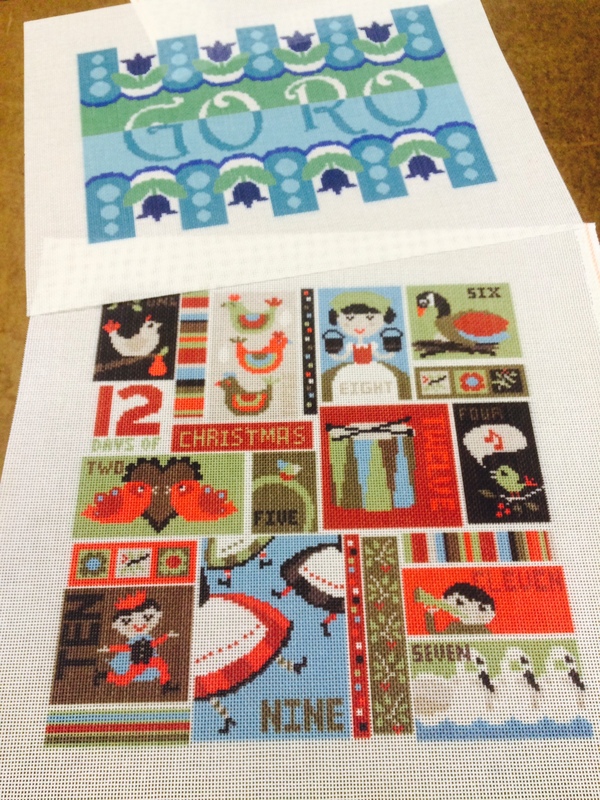 Fun Needlepoint Christmas Kits – New Designs! We’re excited to have started working with some new artists! 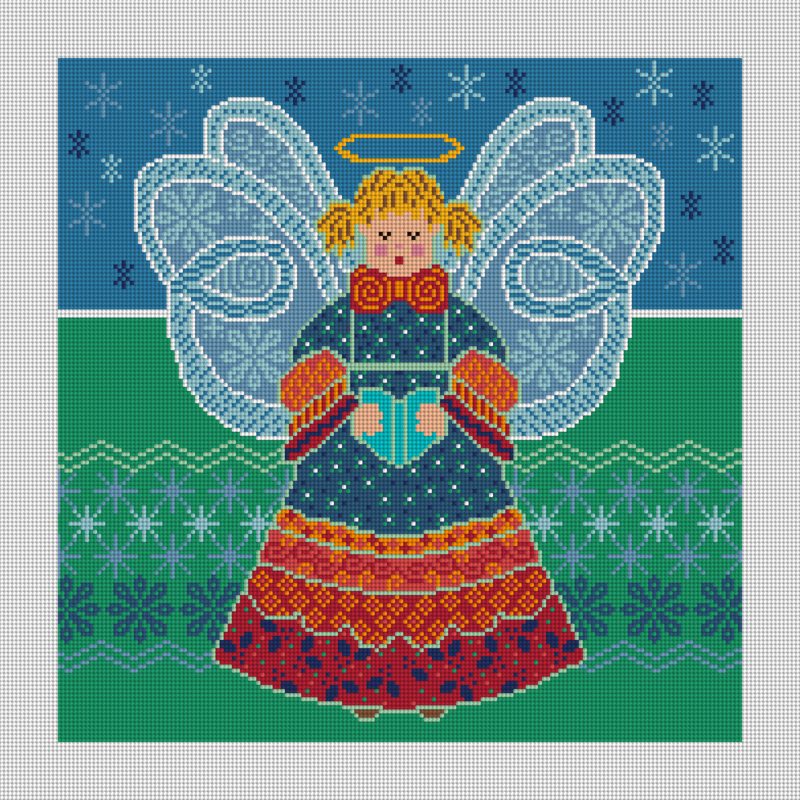 These Christmas needlepoint designs are just the beginning, over the next several months you will see a lot of new, original, fun designs available in our shop www.needlepaint.com. 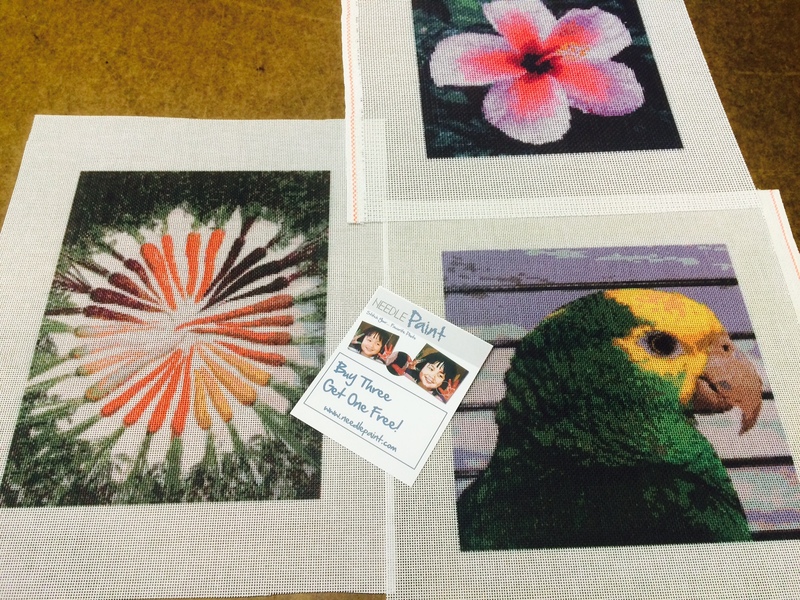 These designs are ripe for choosing non tent stitches and adding embellishments. 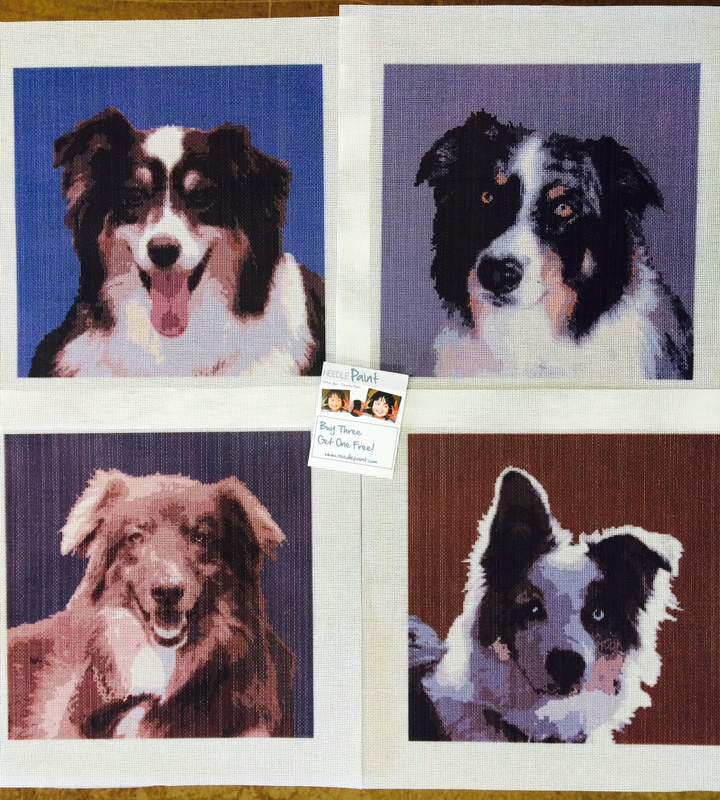 Rather than going over the details of each, I’m posting the pictures with a link to our shop page which tells you more. 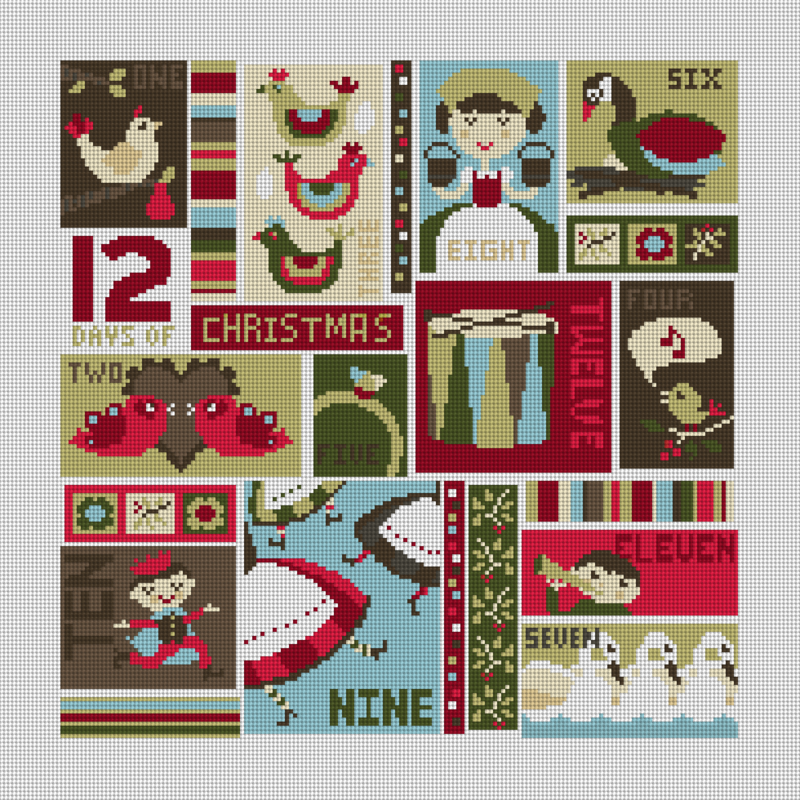 Next up is a modern twist on the 12 days of Christmas in Needlepoint. 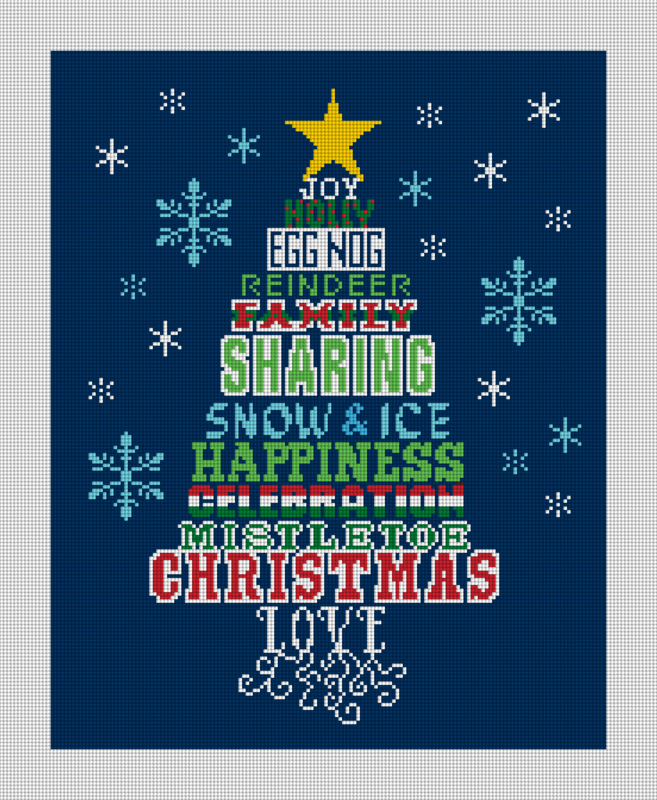 The holidays are all about sharing and family, so we spelled out some of our favorite things in the Sharing Christmas Tree Needlepoint Kit. 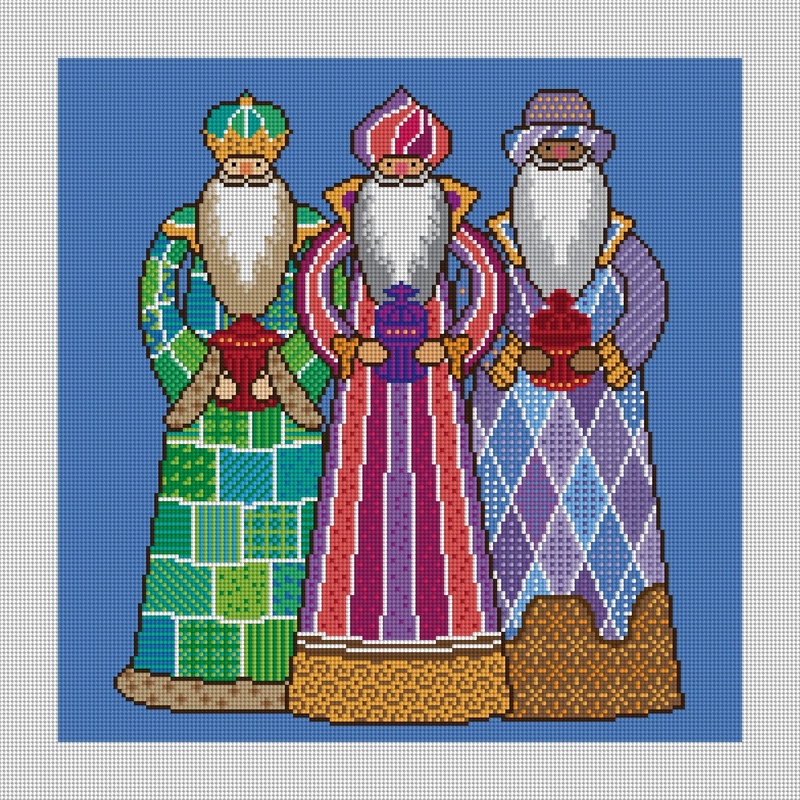 The last design is my personal favorite, a modern version of the three kings. This still is a work in progress, so not on our shop yet, but if you love it, let us know! 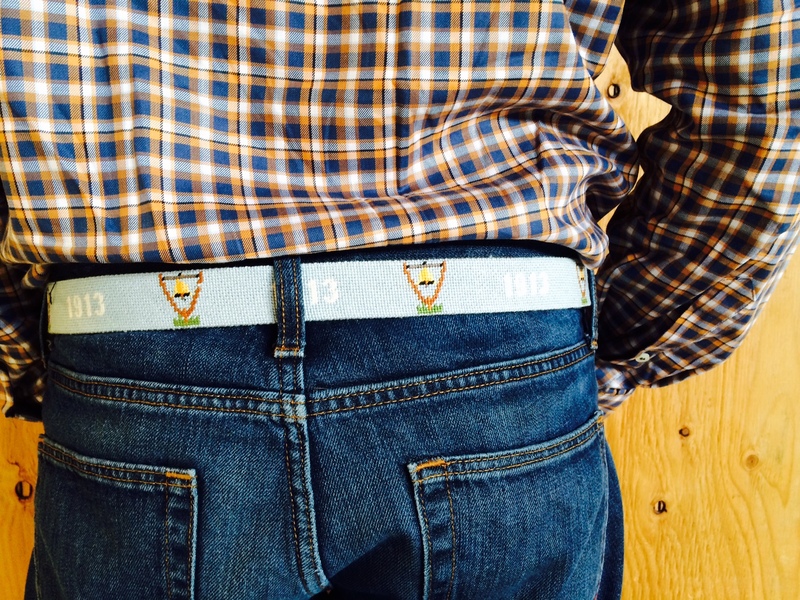 Of course, the penguins on the Isaac and Alexander stockings have to be walking on snow. Should it be soft and fluffy or icy and crunchy? My answer is both. 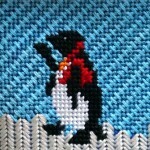 The large penguin on Issac’s stocking is walking of soft fluffy snow which is a variation of the oblong cross stitch. 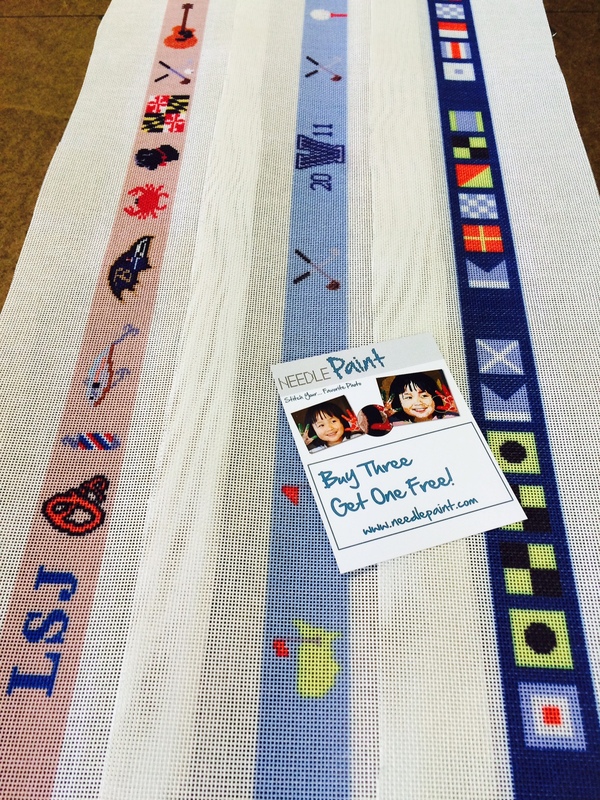 I have worked it across only one horizontal canvas thread rather than on two canvas threads as shown in The Needlepoint Book by Joe Ippolito Christensen. 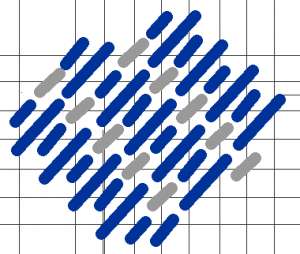 This diagram shows it done in two different thread colors because it is worked in two separate parts. First worked the light yellow stitches and then the dark yellow stitches, but both with the same slightly off-white thread. 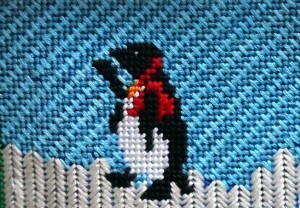 I used a slight off-white thread so that the stark white of the penguin would be more pronounced. The Santa Penguin looks like he is walking on a cloud. 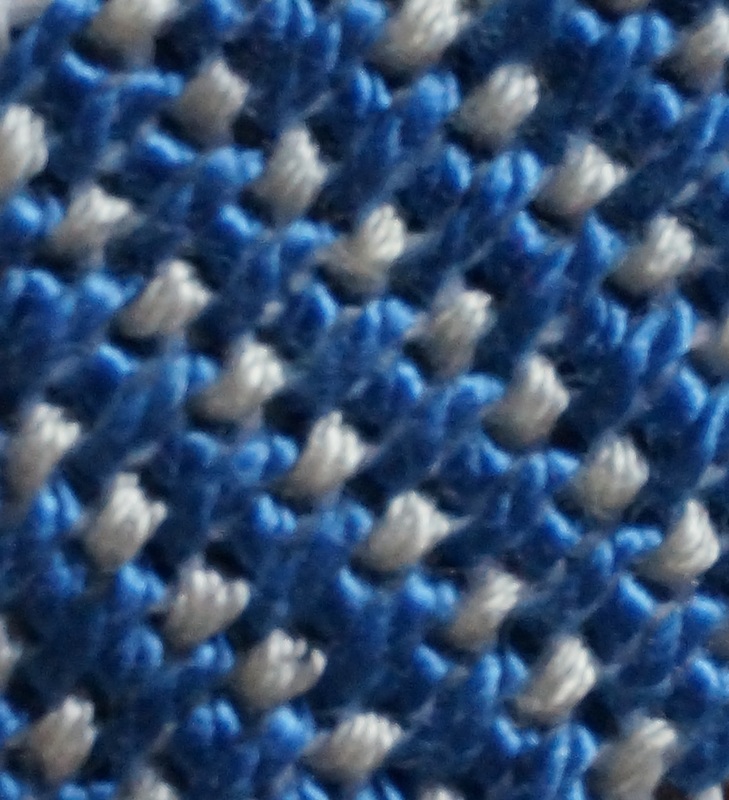 Having worked the stitches over just one canvas thread, I got a thick, dense stitch which added a nice dimension. And yes, he is not finished! He will get an eye for which I will use a glass bead and maybe a tie around his sack. 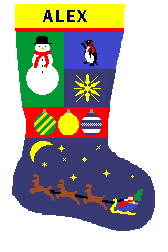 When I got to the penguin on the Alexander stocking, I decided that I didn’t like him floating in the blue as printed in my design. I thought that I would put him on some soft snow like Santa penguin. It didn’t work. So, he was bound to get the icy snow. Using a vertical giant knitting stitch, I put him on ice. I worked the stitches from left starting at the top of each column of stitches. Since there wasn’t any snow printed on my canvas, I was free to put in an many icy spikes and as irregularly as I wanted. The fact that the printed background was blue, the finish stitches have an even icier feel because a bit of the blue peaks through. Again I used a slightly off-white thread to contract the little penguins white and he needs an eye, too. If you look closely at the two penguins, you might notice that the two skies behind the penguins look irregular. It is not just the lighting, They are! In the next blog, I will explain the stitches and threads I used. I’ll probably use the same oblong cross stitch for the exhaust of Santa’s plane on Issac’s stocking. What do you think? 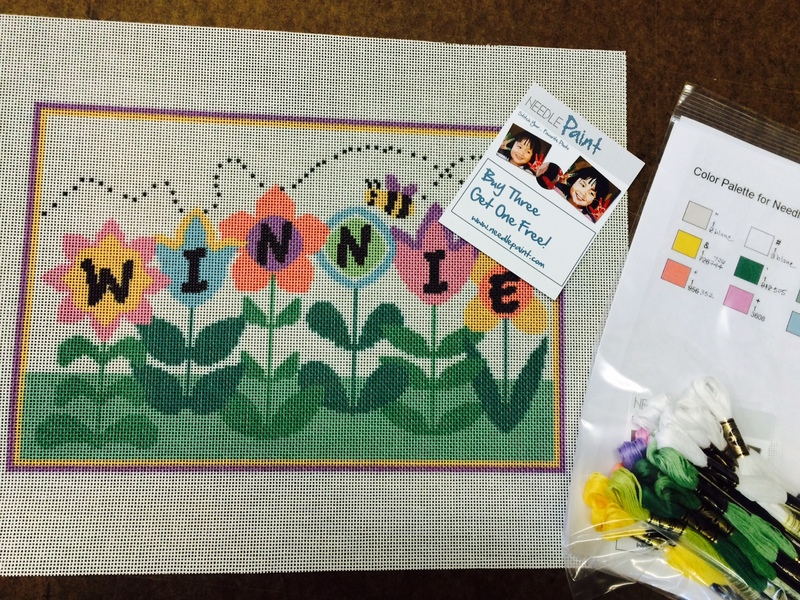 Looking for great ideas to stitch for your kids? 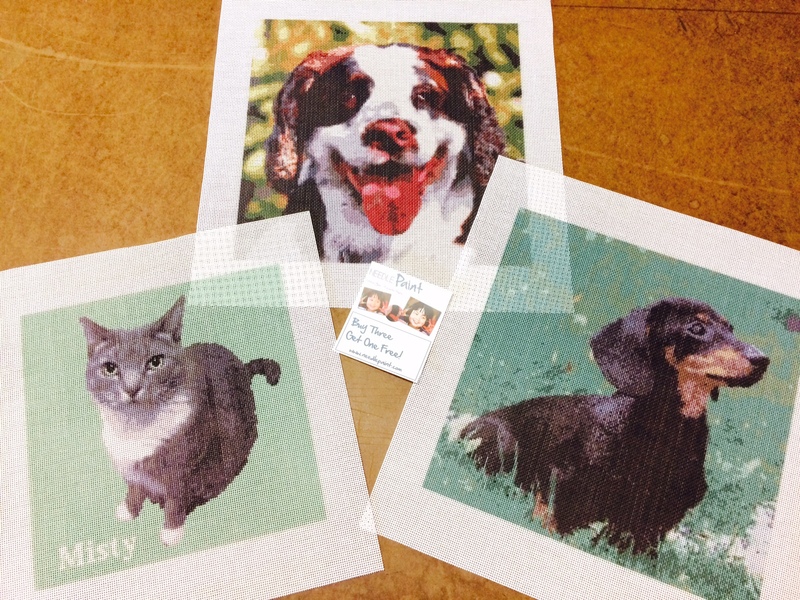 We’ve got a bunch of kids needlepoint designs ready to be personalized, or if you’ve got a great photo you would like to needlepoint, try it out on our website for free, or email it to us and we’d be happy to help! Also, we do custom designs upon request, so if you have an idea that you can’t find anywhere let us know. 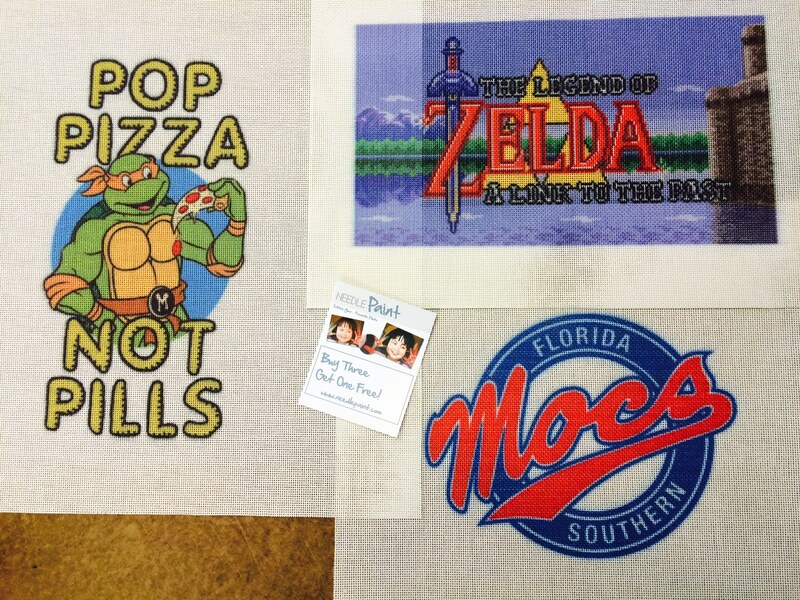 Below are some of the custom needlepoint canvases we made this week! 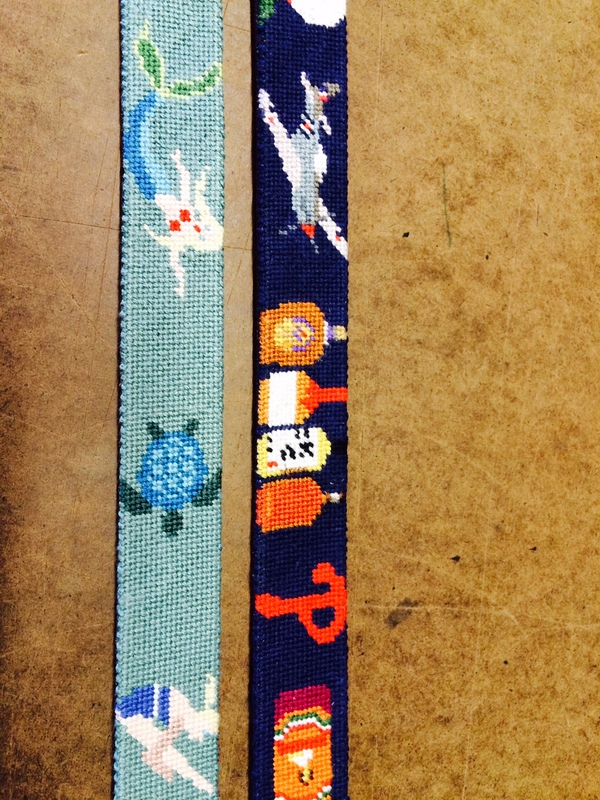 Custom needlepoint belts are fun. We have done kids designs and children’s sizes. 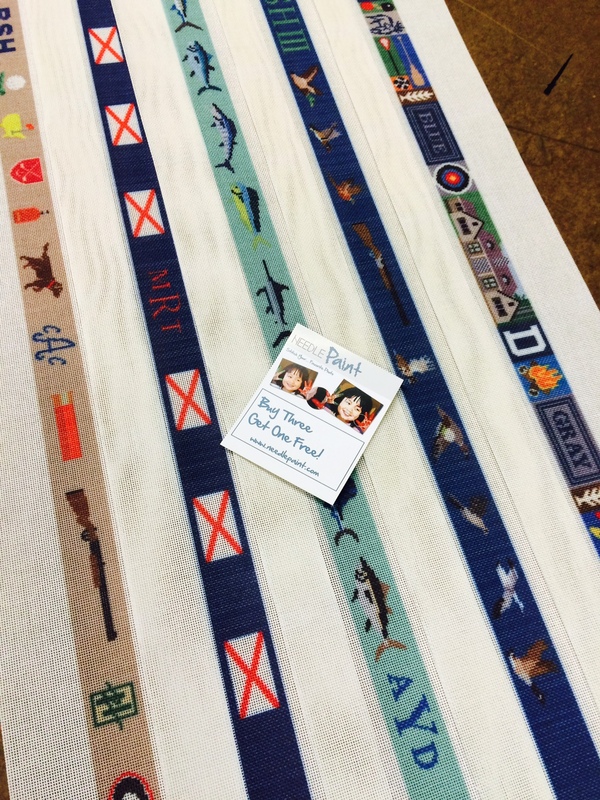 (Written by Peggy Bond) I had a little more time this year than I had with the War and Peace stocking. 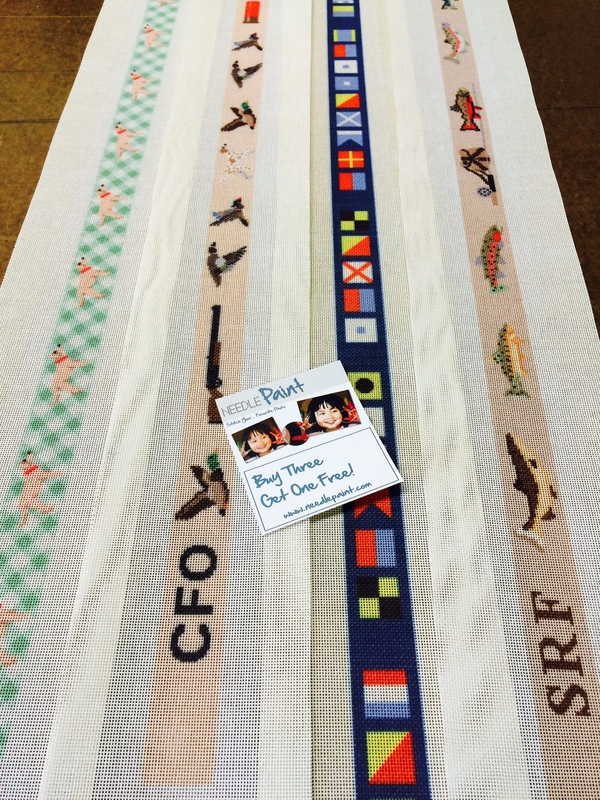 Time is not the issue but the challenge is two needlepoint stockings for my nephew’s twins Alex and Isaac – same but different designs are the order of the day. With plenty of time this season, I decided to experiment with some texture and color variations while stitching. For example, I dressed up the Christmas present in the heel of Isaac’s with a green and yellow checkerboard pattern. 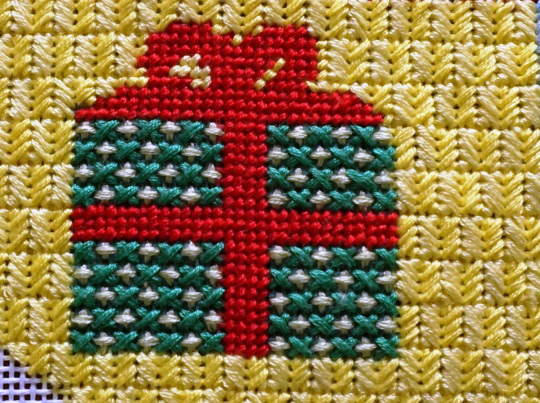 And, then I stitched the background in an oblong reversed cashmere box stitch, but in two different shades of yellow. 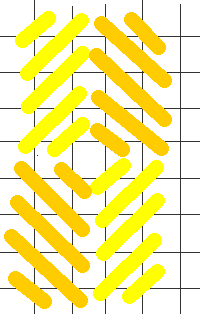 For the background diagram above, I have accentuated the yellow color differences. 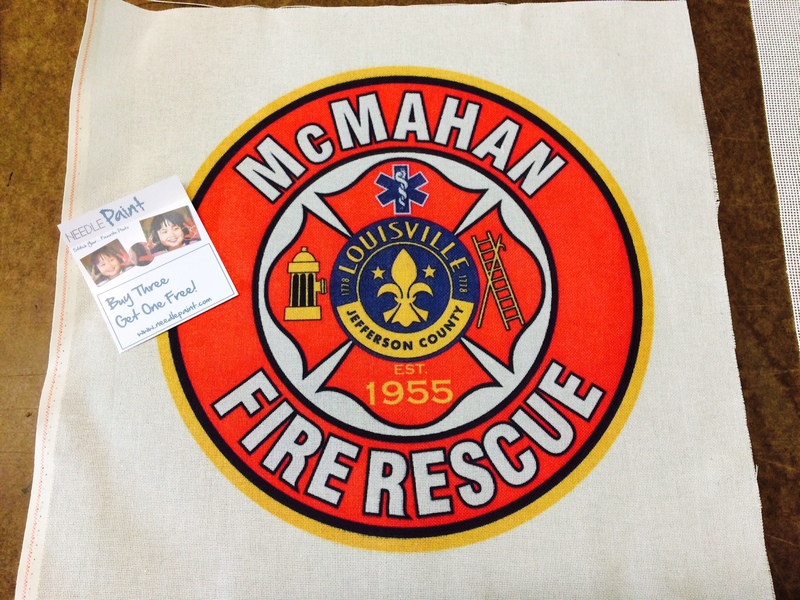 The finished stitching is below. Unless you are aware of the slight variation in the yellows, you probably wouldn’t notice it. 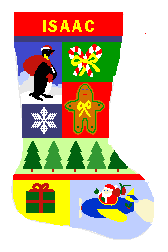 However, it does give the finished stocking an added dimension. It almost looks like variegated thread. 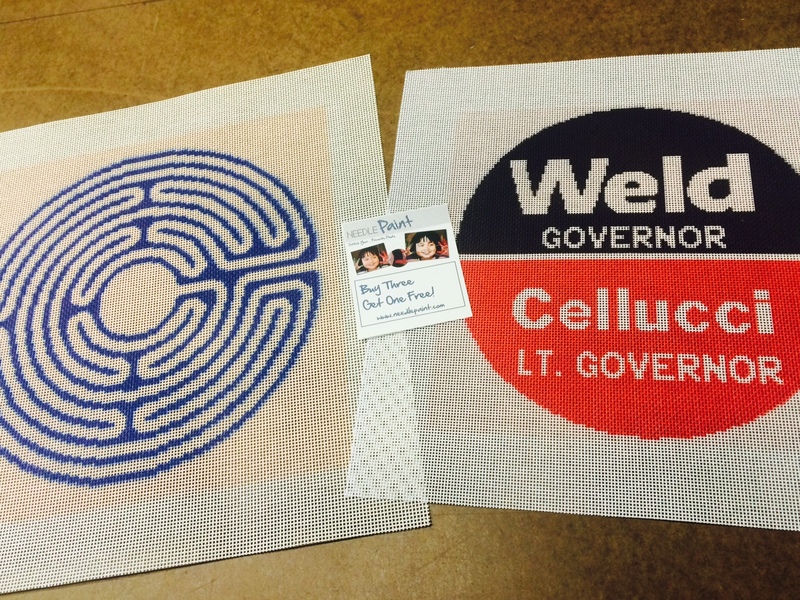 More information on these stitches can be found in The Needlepoint Book by Joe Ippolito Christensen. 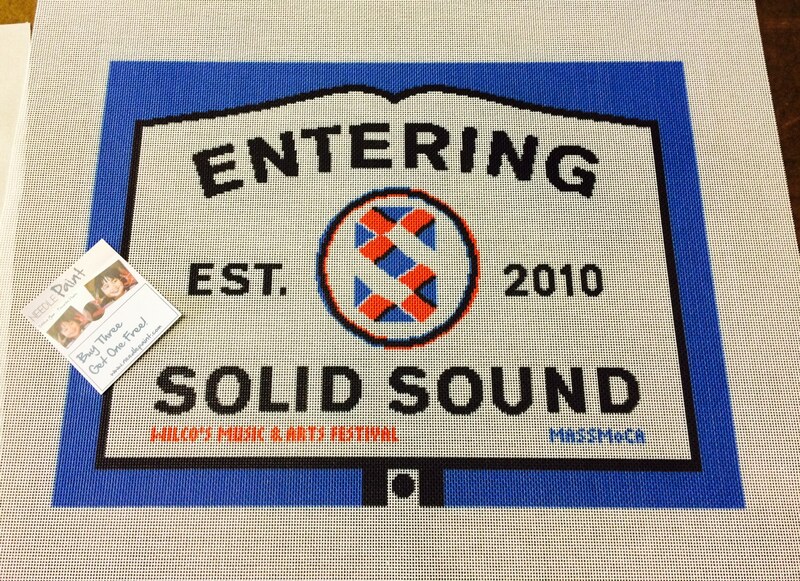 We’ve been very lucky to have word of mouth about our needlepoint designs spreading around the needlepoint community. 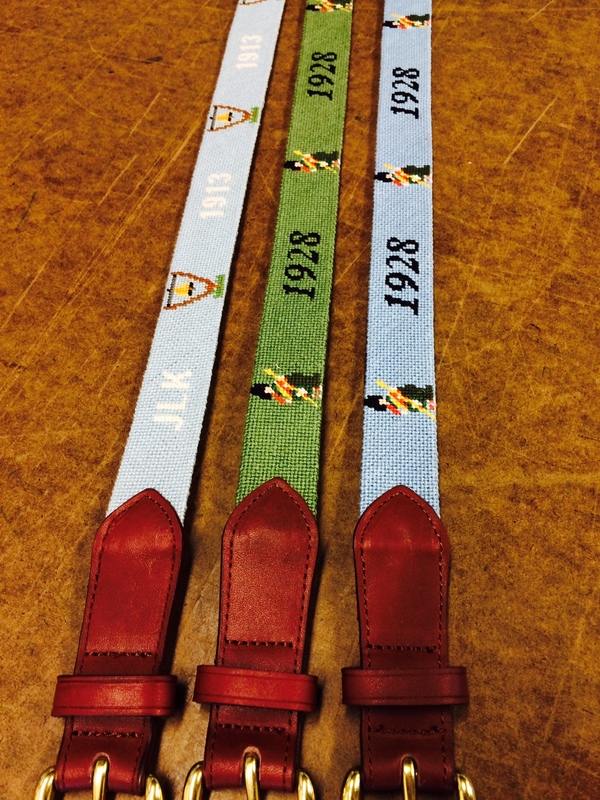 We have had two golf course pro shops contact us recently about making custom needlepoint belts. 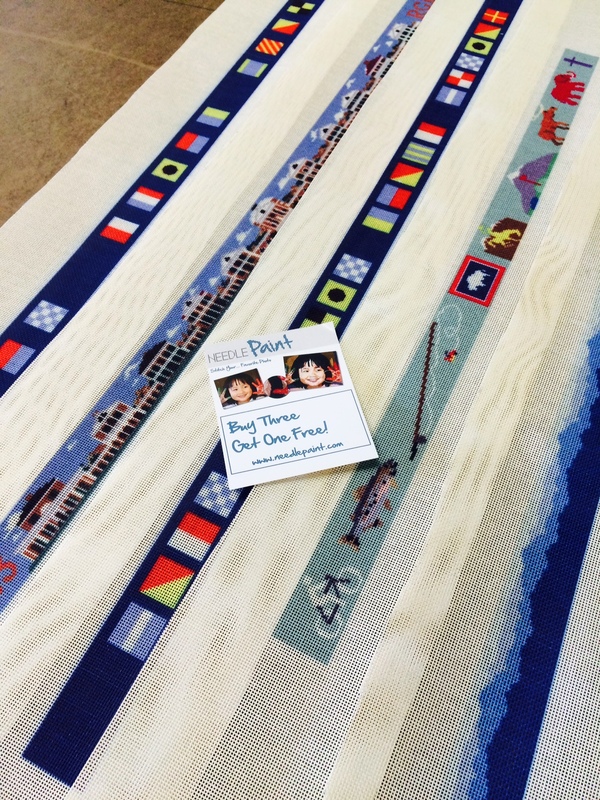 In both cases, it was one of our customers who told them about NeedlePaint.com! 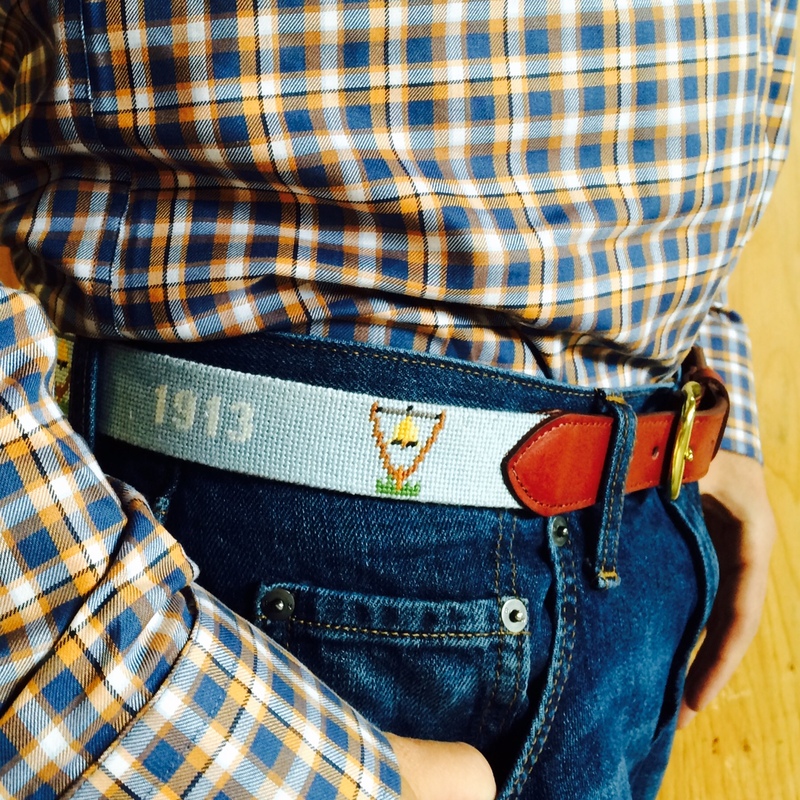 We just delivered 10 belts to one and the other shop manager ordered one for himself and is deciding if he is going to do purchase stock or do a a display setting and let customers order on demand instead of stocking them. 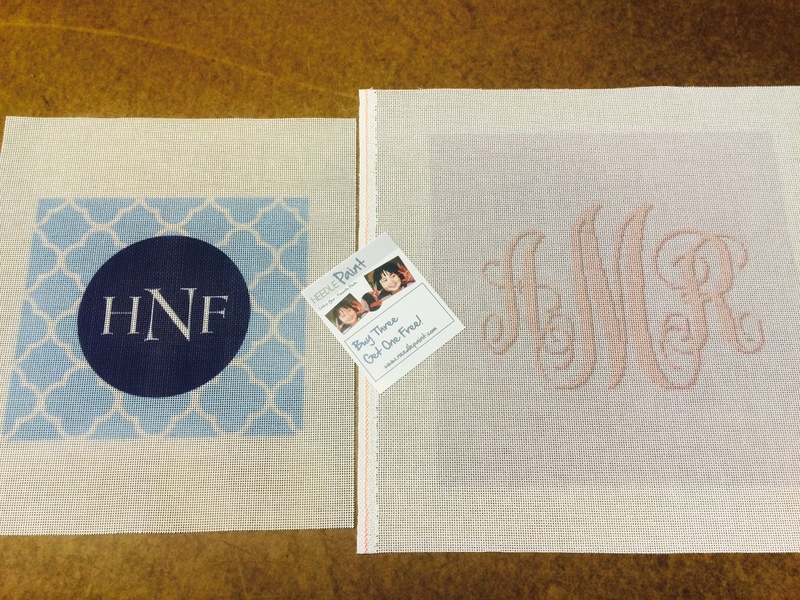 That way they can personalized the design with their own monogram. 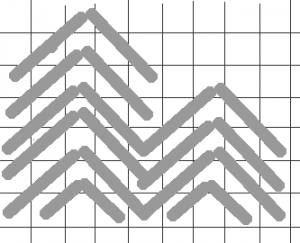 Lets see if you can recognize either of their logos! And just for kicks, here is a close up of a diver and mermaid for a custom design we did for an olympic water polo player. Unfortunately I did not catch the water polo ball in the pictures, but I can email a design preview to you if you are interested, it looks great! You can contact us here.